Today’s Mentor Text is a picture book from Jacqueline Woodson. 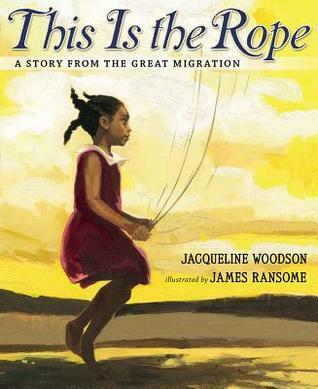 The story of one family’s journey north during the great Migration starts with a little girl in South Carolina who finds a rope under a tree one summer. She has no idea the rope will become part of her family’s history. But for three generations, that rope is passed down, used for everything from jump rope games to tying suitcases onto the car for the big move north to New York City, and even for a family reunion where that first little girl is now a grandmother. After I use this book for interactive read aloud the discussion leads to sharing about items in our lives that are important to us. These items have stories attached to them. The book centers around one item. This is also a good time to talk about focusing on one idea for a story if your students are trying to squeeze too much into one piece. One of the coaching questions I am starting to use is “Which 3 stories are ones only you can tell?” Stories are important to our lives and items can be touchstones to tell those stories. I love this book to illustrate the idea of an item being a souvenir for a chapter of our own lives. After the group discussion I have students write 3 items that are important to them on a post it note or in their writing notebook. Then the students star one item that are willing to share. I will tell the students that starring and sharing does not lock them in to writing about that one during creation time. Then we share out. I tell students that they may add or modify their list based on the discussion. Often when writers talk new ideas spring forth. We get reminded of something important. We need to teach students to take advantage of these sunny writing moments. The shared items are written on a chart so it is accessible to students during writing time. We also talk about what they notice about the structure of how Woodson chose to write the book. We also talk about why she chose to use the repeated phrase. Noticing author moves is important to the writing process but we also have to make sure as the teacher we lead them to make the connections back to their own writing. To understand why an author chose to use a certain craft device also eliminates the need for students to throw everything they know about craft moves into one piece. It is much more effective for them to know WHY as the author they are choosing the way to write it. Connectons to other books we have read that have repeated phrasing is good to add here as well. Woodson uses the repeated sentence stem: This is the rope at the beginning of almost every paragraph throughout the book, which is a great structure to start with especially with reluctant writers. Brainstorm stories which go along with the 3 items the student has chosen. Write a poem or their own children’s book about their most important item. Companion book: Another book that follows a repeated pattern is The Important Book. It is written in poem form and is a good mentor text as well. Todd Henry is the author of several books and is also known as the Accidental Creative. He has a podcast by that name. I receive his newsletter which is interesting and full of creative thought. The most recent newsletter is about 4 things which has inspired this post today. Disappearing is not the same as being lost. When something is lost it is accidental. When you disappear it is intentional. I must admit one of my coping mechanisms is to withdraw. I am learning this is partly because I find people draining if I spend too much time with them – even people I like. I have been reading a fascinating How to Disappear: Notes on Invisibility in a Time of Transparency by Akiko Busch. I heard about it on the Secret Library Podcast by Caroline Donahue. The latest part of the book I was reading was about invisibility and how children have imaginary friends and why. Really interesting stuff. I came to find this book through Shaunta Grimes. Part of her daily process is to come up with 10 ideas for writing, which I have adopted myself. Usually my list consists of random thoughts that might make their way into a story or overhead dialogue ,etc. After reading one her Medium posts yesterday I remembered I had Altucher’s book on my kindle. The question I worked with was: Which 10 people would you choose as mentors and what question you would ask them? It was really difficult! I am curious you would choose as mentors for yourself. The specific questions stumped me as well. I really had to consider why I wanted that person as a mentor first. Black Mirror Bandersnatch on Netflix – This episode is like a choose your own adventure book from my youth but in movie form. I had heard of Black Mirrors but had not watched it up til this past week. As the consumer, you actually make choices on the screen for how the story will progress. It was fascinating. If you like the Matrix I believe you would like this episode. Pretty composition notebooks. I really love these notebooks and have been filling them with my daily writing, reflections, and writing exercises. Feel free to tell me your 4 things, a mentor and or a question you would ask a mentor! I am curious. Every Friday I participate in the FiveOnFriday challenge. You can link here. What do I lack? Currently, I feel I lack peace and direction, but I am working on it. I am so reflective that I always know where I am emotionally lacking I just don’t always know how to fix it so I put my head down and focus on the task or obsession that I am engaged in at the moment. Now it is writing. I want to be the best I can be. I read about it. I do it . I try to find mentors to help me IRL or in the pages of books and blogs. I have my Emily P Freeman book about decision making which is helping tremendously. I do lack directions of what I want to do. The amount of obstacles and out of nowhere hits have been I want to be at home. I want to write all the time. I know it is not a bad thing for a writer to have a day job. I like most of the people I work with and I do like the work that is required in my actual job description. I am reframing it at the moment to get more out of it personally as well. It works for the job aspect but is more fulfilling. I am coaching myself and streamlining my processes to be more consistent and that helps everyone. I do not lack in love. The relationship I have with my husband is awesome and as perfect as it can be. It really is fairy tale like. The relationships I have with all my children are unique to them and I love them dearly and would do anything for any of the 4. The friendships I have IRL and online are strong. I nurture the ones that are mutually life giving and make me happy. I am looking forward to storyaday May next month when there is group writing every day and there is daily interaction with other writers. THAT makes me giddy. Damon Suede is an author on the Joanna Penn podcast this week. He was on the KOBO podcast a couple weeks ago and is definitely worth a listen. He has an interesting approach to writing which involves verbs. When we describe characters we are always looking at lists of adjectives but we need characters to DO SOMETHING in stories. Verbs are what you DO. I have the book but haven’t gotten through it completely but ever since I heard Damon talking about choosing an over arching verb to describe a character I have not been able to shake the thought. Along the lines of my TEACHER BRAND post I also think about what verb would describe me. My verb is CONJURE. I conjure magic and experiences for students and the people around me. I conjure worlds for people to get lost in with my stories. I conjure ideas with blog posts. #dailyverb on Twitter is a great search if you are looking for interesting verbs. Today’s verb is BARRICADE. Writing Prompt: Use the verb from #dailyverb to stimulate a list of 10 ways to use the word in a story or just what comes to mind. It makes for an interesting mind map! Grab your cup of coffee and sit in a comfortable chair around this oak table and let’s chat! I am having my regular black coffee this morning but I can make you iced coffee if you prefer. Even though it is warmer it doesn’t stop me from drinking several hot cups. I think I will bring us glasses of ice water just for variety. If we were having coffee, I would tell you I am participating in the Two Writing Teachers March Slice of Life Challenge. Teachers all over the world are posting on their blogs daily and at the TWT blog and then commenting on at least 3 posts. I have read some inspirational posts this week. I am going to miss this challenge when it is over. If we were having coffee, I would tell you there was lots of testing this week at school. We have a district program called IREADY that requires a diagnostic 3 times a year. We are taking the end of year test a little early in preparation for the state test. There have been some incentives put in place for our 7th and 8th graders and they did much better this time. If we were having coffee I would tell you I wrote everyday. I also started work on a coaching workshop that I hope to teach within the next year. I want to make it as interactive as possible – no PowerPoint! The other writing I did was reflective. I also worked on a few stories. If we were having coffee I would tell you I read at least one essay, one poem and one short story every day this week to continue my Bradbury Trio program. I was just recording them in my notebook but now started a Google Folder to log some links. I finished one notebook and started a new one so now the lists are separated! If we were having coffee, I would tell you our team consultant visited on Wednesday. He is always interesting to talk to. He talked about paying attention to students who are always doing the right thing. Some of the things he said caused me to write 3 notes to students thanking them for various behaviors. One student is a fantastic writer and I am always honored she shares her stories with me. Another student went up 26 points on his diagnostic test which is about 2 grade levels. A third student is always kind and smiling. She is uplifting to everyone around her. I also write a couple thank you notes to teachers. Thank you notes have power! If we were having coffee, I would tell you the students I gave the envelopes to at first didn’t know what to do with them. In this digital age paper is not common. They weren’t sure if they should open them or not! The looks on their faces were cute and surprised. If we were having coffee I would tell you I am enjoying the 10 day writing challenge. The prompts are interesting and different. The game name from the Day 1 prompt I liked so well that I am using part of it for my writer bio. If we were having coffee I would admit to you I did not go to my in real life writing group this week. I was tired and the drive seemed too long to go. I had not prepared a story to share. There is a celebration event I will be going to next month. My online group was not as active this week on the Slack channel. There seems to be a lot going on with them swirling around spring break and college admissions and other life stuff. I have missed the conversations. If we were having coffee I would tell you yesterday was spent outside. We went to the park and I went for another run. It was 50 degrees and sunny all day! Today will be an inside day with cooler temps and thunderstorms in the forecast. Today is about being low key, reading, and writing! If we were having coffee I would tell you I loved this chat with you today! It really is a highlight of my week. What is the best thing that happened to you today? I am participating in the Slice of Life Challenge sponsored by Two Writing Teachers. Each day in the month of March teachers from around the country post to their blogs and comments are made on at least 3 posts. The Pixar formula has been used for numerous movies from the company before and after they merged with Disney. Many people also use it as a writing exercise and story frame. On Thursday I was able to run for the first time outside. I do not like the treadmill but hate the wind more. I have run a lot of miles outside to prepare for a lot of long distance races but am not in that mode now. It is about fitness and muscle. I have been getting great results with the incline function on the dreadmill which makes it tolerable. It wasn’t green yet but it was melodious as I ran listening to the birds. I saw a large blue jay playing with a squirrel too. Today I will use the PIXAR formula to start a story upon a runner. Once upon a time there was a selfish girl who got mad at everyone around her for actions she poisoned her own life with. Because of that she will follow the path even though her intuition will tell her not to and a squirrel will trip her. I don’t know what else…I will ponder some more! So, the question is – What will you write today? I will also write with my prompt from the 10 Day Challenge: it is about pronoia a word that is new to me that means the world is conspiring to give you what you need. It is a fascinating prompt. I have been thinking about it all morning! Maybe I will make it part of the runner story too. I am participating in the Slice of Life Challenge at twowritingteachers.org. I’ve had the honor of being a coach in two corporations but the roles were glaringly different. One coaching was mandatory and I was an evaluator/quasi admin. Here, it is voluntary and not evaluative. But it got me thinking about perception and how I’m seen. The Better leaders better schools Leadership podcast last week was guest hosted by Amber Harper who is the founder of The Burned In Teacher. It is an acronym and she helps teachers go from burned out to burned in. She was a guest for over a week sharing tips and action steps. One activity that got me thinking was TEACHER/COACH Brand. Every product has a brand identity. When you think of NIKE or CRAYOLA certain adjectives come to mind. It is the same for teachers. There are teachers who are known for Quiet Power or great discipline or zany ideas and innovation. Your coworkers have a brand. Your principal has a brand. The actionable idea is to poll your co-workers and see what adjectives they would use to describe you. You make own list of adjectives of how you want to be perceived and then embody those adjectives as much as you can. The idea is also to see if there is a discrepancy. The words I received were not surprising. I am still pondering if they are the right words for what I want to convey and achieve. I have considered sending an anonymous poll to the whole staff. I am not sure yet. Coming up with ideas for writing is usually not my problem. DECIDING on which idea to write about it is normally the issue. I have gone up and down and all around about what to write today. I looked through my draft blog posts, I looked through my BLOG folder in Google, I read other slices this morning, I listened to some favorite podcasts…nothing resonated that I want to share publicly. While scrolling on Instagram yesterday I noticed an advertisement for a 10 day writing challenge. I cannot pass up prompts sent to my mailbox so I signed up. The prompts are written out in a community, in an email, in video and audio formats. The day 1 prompt is refreshingly new to me and I am in the process of writing it. The Day 1 challenge is to write your own Game of Thrones name like Daenerys, the mother of dragons. You do not need to be a fan or watcher of Game of Thrones to do this prompt. For context, the heroine of the show is a young lady, a Queen, named Daenerys Targaryen. She comes from a long line of rulers, but her ancestors were not well-loved. Her own dad was, in fact, torturous and murderous. And she is on a mission to break that cycle; to still walk in her regal ancestry, but to be a queen that liberates instead of imprisoning, and rules with freedom rather than fear. So, the question is – Who are you today and now? I have not written my completely yet but I am a mother, a wife, a teacher, a coach. I am an ultra runner and an ultra reader. I am the writer of stories. I am a yogi and an accidental inspirationalist. We shall see what else I come up with throughout the day! Here is a link to the challenge. Other questions for today: Do you enjoy writing challenges other than Slice of Life? What others have you participated in? Have you ever considered starting your own? The Bradbury Trio project is going quite well! I am “feeding the muse” as Bradbury would say with all the lovely words. It is also helping that I am reading essays specifically about creativity and writing. I am starting to get some recommendations from others which is greatly appreciated. I was reminded this past weekend of Pema Chödrön whose words helped me through a trauma a couple years ago. I will seek her words out moving forward. “Just This Side of Byzantium: Dandelion Wine” R.B. Have you read anything really great I need to read? Tell me!